UNSETTLED WEATHER CONTINUES TODAY: Not much change in the Alabama weather situation today… the sky will be occasionally cloudy with scattered to numerous showers and thunderstorms. We have a few clusters of storms on radar early this morning, but most of them will come later today. 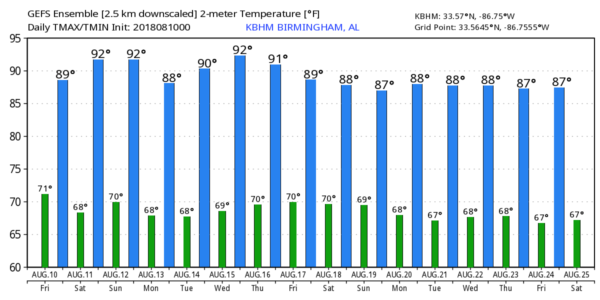 The high will be in the 80s for most communities; below average for mid-August in Alabama. THE ALABAMA WEEKEND: Sinking air motion over the state tomorrow should be a drier day; any afternoon showers or thunderstorms should be few and far between. With a good supply of sunshine, the high will be pretty close to 90. Then, on Sunday, we will bring back the chance of “scattered, mostly afternoon and evening showers and thunderstorms” with a partly sunny sky. The high Sunday will stay close to 90… chance of any one spot getting wet is 15 percent tomorrow, and 40 percent Sunday afternoon. NEXT WEEK: We will maintain the chance of scattered showers and storms Monday, then Tuesday looks like a drier day with only isolated showers. The rest of the week will feature pretty standard summer weather… partly sunny days with pop up thunderstorms during the afternoon and evening hour. Highs through the week should be fairly close to 90 degrees. See the Weather Xtreme video for maps, graphics, and more details. TROPICS: All remains quiet across the Atlantic basin and tropical storm formation is not expected through the weekend. ON THIS DATE IN 1980: Hurricane Allen, which reached Category 5 status on the Saffir–Simpson Hurricane Scale on three separate occasions, made landfall on the lower Texas coast as a category three storm. Overall, Allen killed at least 269 people and left $2.57 billion in damages (1980 US dollars), mostly within the United States and Haiti. Because of its impact, the name Allen was retired from the six-year revolving list of Atlantic tropical cyclone names in 1981 and the name was replaced by Andrew. The name Andrew was subsequently retired after the 1992 season’s Hurricane Andrew. The remnants of the storm precipitated the end of the heat wave of 1980 in places like Dallas/Fort Worth, Texas, which had recorded 69 days of 100 degree heat.